Lt. Gen. Paul Funk, second from left, with Special Forces troops near Manbij, Syria, on Feb. 7, 2018. 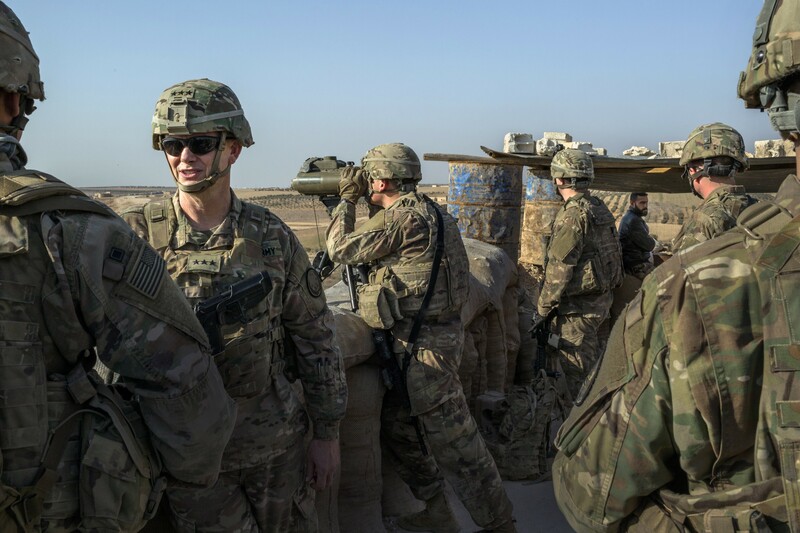 The U.S. has started withdrawing its troops from Syria, an American military spokesman said on Friday, Jan. 11, 2019, further muddling the Trump administration’s plans for disengagement from one of the Middle East’s most complex battlefields. WASHINGTON — The U.S. military has started withdrawing some equipment, but not yet troops, from Syria as part of President Donald Trump’s order to wind down that battleground against the Islamic State group, two Defense Department officials said Friday amid continuing confusion over plans to disengage from one of the Middle East’s most complex conflicts. The officials said the number of U.S. troops might actually increase slightly in Syria, to help protect the final process of pulling out — an operation that is still expected to take at least four to six months to complete. There are currently about 2,000 troops — mostly Army soldiers and Marines — in northeast Syria or in the Middle Euphrates River Valley to oust the remaining pockets of Islamic State fighters and secure newly-liberated areas from their return. A vaguely worded statement from the U.S. military headquarters in Baghdad, which is overseeing the fight against the Islamic State, said the withdrawal process from Syria had begun. Last month, officials said, Trump said he intended to pull out U.S. troops within 30 days. But as recently as Sunday, the White House national security adviser, John R. Bolton, had said that the pullout was conditional — based on circumstances that could leave U.S. forces there for months or even years. The surprise announcement Friday, from Col. Sean Ryan, the spokesman for the U.S.-led coalition against the Islamic State, gave no indication of whether any troops were being pulled out or whether the United States was taking other measures that could be considered a withdrawal. Trump has made no secret of his desire to bring the troops home, saying that they were sent to fight the Islamic State and that their mission has nearly been accomplished. In an apparently snap decision after a telephone call with the Turkish president, Recep Tayyip Erdogan, he said last month that he wanted the troops out within a month. That decision prompted the resignation of two top aides — Defense Secretary Jim Mattis and Brett McGurk, the special presidential envoy to the coalition fighting the Islamic State — and the reformulation by Bolton, a hawkish adviser whose principal Middle East aim is to contain the ambitions of Iran, which is entrenched in Syria.